Left: Honorees of the 1996 annual "Lifetime Achievement Awards." Left to right: FRIENDS Foundation members, Natavan Sheykhova and Rafael Huseinov. Honorees: Mikail Abdullayev, Badura Afganly, Rafig Seyidzade (FRIENDS), Fatma Mehraliyeva, Gamar Almaszade, Ann Kauzlarich (FRIENDS), Jovdat Hajiyev, and Rafig Guliyev (FRIENDS), October 15 at the Rashid Behbudov Theater. On October 15, the FRIENDS of Azerbaijan Culture Foundation (Azerbaijan Madaniyatinin Dostlari) gave "Lifetime Achievement Awards" to six outstanding individuals who have dedicated their lives to the treasury of art and culture in Azerbaijan. These honorees were also chosen because they have won the recognition and love of the community for their achievements. Anne Kauzlarich, Co-Chair of FRIENDS and wife of the U.S. Ambassador, presented the awards along with Khavar Kambaizade, Chevron's Resident Representative in Baku. Monetary awards for each honoree were underwritten by Chevron Overseas Exploration. The presentation of "Lifetime Achievement Awards" is being planned as an annual event. Fatma Mehraliyeva was honored for her performance of Azeri folk songs and mugam. She starred as "Telli" in the film version of Uzeyir Hajibeyov's opera, "Arshin Mal Alan", in 1945. She is considered to be unequaled in performing the mugam, "Kesme Shekeste." Below: Anne Kauzlarich, wife of US Ambassador and Co-Chair of the FRIENDS of Azerbaijan Culture Foundation, present a "Lifetime Achievement Award" to Fatma Mehraliyeva, famous mugam singer. Resident Representative Khaver Kambaizade, of Chevron which sponsored the event, looks on. Jovdat Hajiyev is revered as one of Azerbaijan's best composers of symphonic music. In addition, for many years he was deeply involved with organizing higher musical education and directing the Azerbaijan State Conservatory, which has trained hundreds of young, talented musicians. His wife, Amina Dilbazi, is a famous Azeri dancer, and their sons are both well-known musicians. Gamar Almaszadeh was one of Azerbaijan's first ballerinas and is usually associated with the star role of "Gulyanag" in Azerbaijan's first ballet, "The Maiden Tower," which was composed by Afrasiyab Badalbeyli. She is also deeply respected for her dedication in training ballerinas. Badura Afganli is associated with theater, cinema and dance. She is admired for designing the costumes for most Azerbaijani movies, the Azerbaijan National Drama Theater, Philharmonic Hall, and State Ensemble of Folk Singing and Dancing. Many of her paintings hang in art museums throughout the country. Mikail Abdullayev is a famous Azeri painter who often chose as his subject classical Azerbaijani literature and culture. Many of his works are dedicated to the poetic works of Fuzuli, Nizami and Nasimi. Vera Shirye is known as a gifted actress and powerful orator who devoted her life to developing stage culture. For decades, she worked with the Russian Drama Theater. Her recitations of poems of Samed Vurgun, Suleyman Rustam, and Rasul Reza in the Azeri language are so fluent and powerful that many don't even realize that she is not Azerbaijani herself. On October 25, cellist Andre Yemelyanoff and pianist Steven Swedish gave a concert at Baku's Chamber Music Hall where they performed works by Samuel Barber and Johannes Brahms. 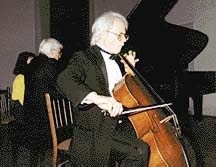 Left: Performance by American musicians: Pianist Steven Swedish and Cellist Andre Yemelyanoff who performed on October 25, at the Baku Chamber Hall (Old German Church). During the second half of the performance, the Azerbaijan Symphonic Orchestra under the direction of Yalchin Adigezalov joined Yemelyanoff with Tchaikovsky's "Theme and Variations on Rococo." Both Yemelyanoff and Swedish gave Master classes to outstanding Azerbaijani musicians for several days prior to the concert.